It’s really quite frightening… is this what happens when you can’t take the spell checker from your PC into the real world ? 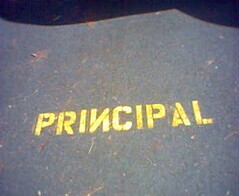 What makes it even scarier is that the same mistake is in the Deputy Principals’ parking space as well. Is my daughter going to the right school I wonder ?! This entry was posted on February 26, 2005 at 6:30 am and is filed under Uncategorized. You can follow any responses to this entry through the RSS 2.0 feed. You can leave a response, or trackback from your own site.